Health care providers have increasingly relied on telehealth in conjunction with evolving developments in technology and health care delivery systems to improve patient access and quality of care. Telehealth has transformed how health care is provided to and accessed by patients. As the use of telehealth continues to expand, health care providers, third-party payers, and practitioners must carefully structure and negotiate agreements to ensure regulatory compliance, navigate risks inherent in implementing telemedicine practices, and provide quality care and minimize liability. Proposed laws and rules related to telehealth will continue to expand coverage. In fact, many national insurance companies have implemented online medicine by adding access to approved telehealth networks for their insureds. For the most part, the provision of online medicine and related telehealth services by health care providers is subject to the same regulatory and liability issues as “brick and mortar” providers. Issues regarding care given across state lines, HIPAA violations, kickbacks, and inappropriate prescribing for drugs, medical devices, and durable medical equipment are all key considerations for health care providers that decide to provide telehealth services. 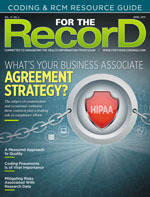 Providers entering into agreement for the provision of online health care must be aware of the regulatory and liability risks associated with telehealth and address the patient consent, fraud and abuse, licensing, and HIPAA hurdles. In 2015, the Centers for Medicare & Medicaid Services (CMS) announced additional telehealth coverage. CMS released the final rule on October 31, 2014, which added seven telehealth billing codes, including codes for psychotherapy, prolonged office visits, and annual wellness visits conducted through electronic means. CMS also added language to pay for remote patient monitoring for chronic conditions. Prior to 2015, Medicare did not pay separately for these services and bundled them into evaluation and management codes. Social Security Act Sec. 1834(m) defines the conditions for payment for telehealth services under Medicare. The act requires that a patient must be present at a rural, clinical originating site to receive care via telehealth. Medicare reimbursement for telehealth is only available at clinical sites in rural areas; patients seeking care in metropolitan areas are unable to access these services. CMS has reimbursed providers for remote patient face-to-face services via live video conferencing requirements when the eligible beneficiary in the originating site is located outside of a metropolitan statistical area (MSA) for eligible medical services and the telehealth is provided by eligible providers (physicians, nurse practitioners, and/or physician assistants) and an eligible facility. If these requirements are met, the practitioner delivering services is reimbursed for medical services in the same amount as the current fee schedule and nonmetro facility eligible for facility fee. However, Medicare reimbursement for telehealth continues to be available only at clinical sites in rural areas. CMS restricts telehealth services to beneficiaries that live in counties outside of an MSA and within a health professional shortage area as designated by the federal government. Medicare does not cover home health services provided via telehealth. Medicare reimbursement is not permitted for any covered home health services paid under the home health prospective payment system. In addition, Medicare does not reimburse for remote non-face-to-face services because CMS does not consider them to be telehealth. Instead, they are covered as on-site services. An example of a remote non-face-to-face service is an interpretation of an ECG that has been transmitted via telephone. Telehealth providers participating in receiving payment from Medicaid for telehealth services should take note of the ongoing project to review state Medicaid payments for telemedicine and other remote services. The project of the Office of Inspector General (OIG), “Medicaid Services Delivered Using Telecommunication Systems” was added to the November 2017 Work Plan update. The final report is expected to be issued this year. Medicaid’s telehealth requirements differ by state. The coverage, coding, and documentation rules are not always easy to find. Most telehealth rules and requirements are not found in state regulations but rather in policy manuals and transmittals. Medicaid providers should continue to monitor “Medicaid Services Delivered Using Telecommunication Systems” for any updates and reports which can serve to provide guidance for the provision of telehealth to Medicaid patients. State laws governing telehealth continue to expand and evolve as technology impacts access to health care and the provision of patient care. Currently, there are no uniform telehealth regulations other than those from Medicare and Medicaid. No federal telehealth statutes or regulations have been promulgated. Most of the telehealth regulations have been devised and enforced on a state level due to scope of licensure and reimbursement considerations. Many states have updated or adopted new state law to require private insurers to cover services provided through telemedicine if the same services provided in-person are covered and reimbursed by the insurance companies. Generally, these “parity” state laws require health insurers to cover and provide reimbursement for services provided via telehealth in a comparable manner to how the payer would for the same services provided in person. States must regulate issues related to the establishment of the physician/patient relationship; patient consent and disclosures; scope of practice, licensure, recordkeeping, and information access; clinical and prescription standards; payment practices; and coordination of care. Given the regulatory climate and increasing utilization of telehealth by health care providers and patients, telehealth business models and provider arrangements continue to evolve. Providers should consider how telehealth is provided pursuant to the model and provider arrangements to ensure regulatory compliance, proper documentation, and the ability to receive reimbursement. • Online patient access/portals/technical support: A sleep disorder center provides patients with online access to view results from a polysomnography (sleep study) and offers options regarding the treatment of sleep disorders. • Chronic care management: A pain management clinic contracts with a physician practice group for chronic care management and follow-up services. • eHealth, mHealth, and medical apps: Self-tracking apps for diagnostics, care support, and monitoring that may include weight loss, smoking cessation, medication compliance, and durable medical equipment compliance. Providers should consider and monitor the structure of business models and provider arrangements for regulatory compliance and ensure they are properly documenting the provision of telehealth and receiving the appropriate reimbursement. Navigating telehealth requirements for licensing, scope of practice, and reimbursement can be challenging. Evolving technology and health care delivery systems will continue to expand and increase the use of telehealth. There are many such initiatives underway through Medicare, Medicaid, and private insurance companies. While opportunities are plentiful to implement and utilize telehealth, providers must continue to monitor the evolving regulatory landscape to ensure compliance, receive reimbursement, and avoid potential pitfalls and exposure to liability. — Jayme R. Matchinski, Esq, is an officer with Greensfelder, Hemker & Gale, PC, who focuses her health care practice on regulatory compliance, reimbursement issues, and the provision of telehealth by health care providers. She can be reached at jmatchinski@greensfelder.com.